Slow Manifesto | Lebbeus Woods Blog, a new book featuring a selected number of posts from his blog published by Princeton Architectural Press and edited by Clare Jacobson, provides a fitting last testament for this great mind that we lost in 2012. While the editor admits to not having followed the blog while Woods was alive, despite having edited several of his books, the 300 plus entries he made between 2007 and 2012 provide more than enough material. As such, 150 selected by Jacobson, also a friend of the late architect and artist, provide his musings on an astonishing range of topics—from the state of architectural criticism to his thoughts on the activities of his contemporary starchitects. Continue reading at Spacing Magazine. 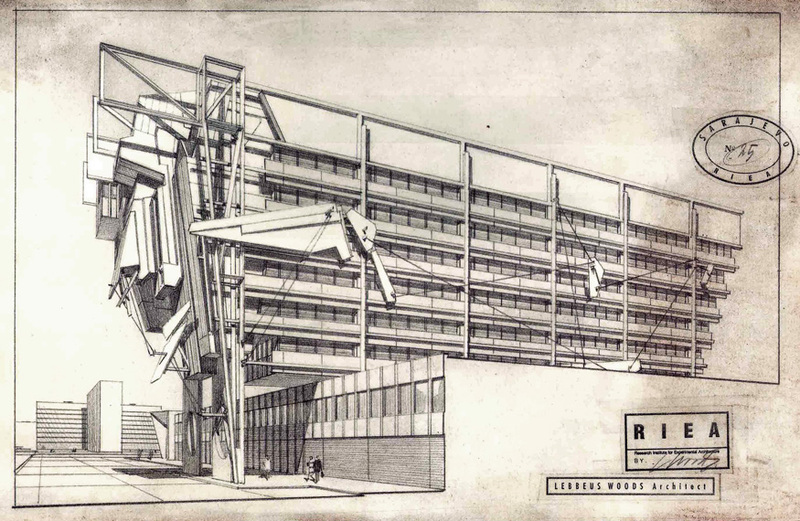 For more information on Slow Manifesto | Lebbeus Woods Blog visit the Princeton Architectural Press website. Ability to delegate, supervise, and mentor junior staff members. Salary is commensurate with qualifications and experience. Generous benefits, including medical/dental insurance and retirement funds contribution matching. Please email resume in PDF with cover letter/email, and “YourName_Intermediate Transit Architect/ Urban Infrastructure” in subject‐line, attention Charlene Kovacs, ckovacs@via‐architecture.com. Please include samples of your work, keeping total email size below 2MB. Single-family housing became near ubiquitous in the interwar period. The City’s farm land was divided out along the grid of streetcars and developed further and further southward with new tracts of housing. The surveys that defined properties for this grid were similarly focused on a streetcar suburbia. Outside of the early City’s Victorian core and some of the post-war ranch properties in the south of the City, most of this grid was divvied up into regular chain (66ft or ~20m) lots and blocks. Depending on configuration, that meant that the most common type of lot in the City was a half chain (33ft or ~10m) wide. 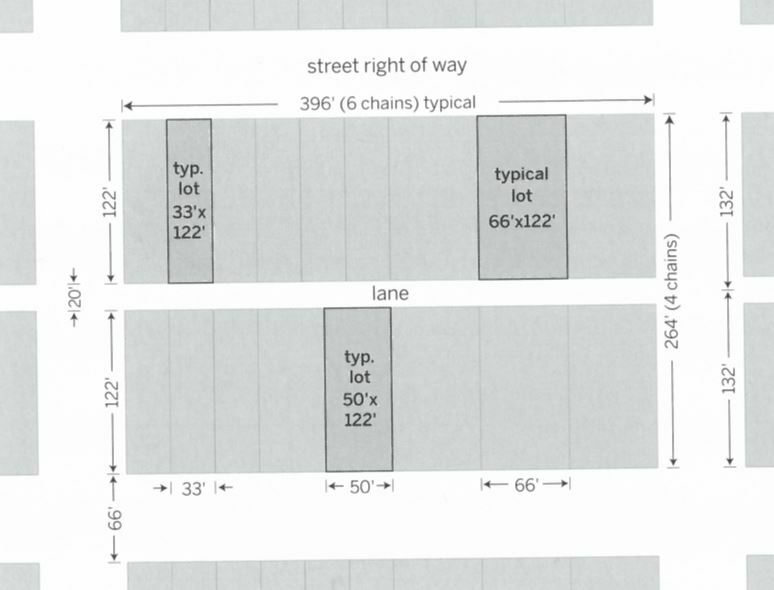 Lanes divided almost every block; most were and were 20ft (or 6m) and most blocks were four chain deep. That meant that the most common development lot in the City had a shared scale of approximately 33ft x 122ft (~10m x ~37m). There are variations, but this lot type is almost ubiquitous. The types of allowable housing on these subdivided lots changed drastically, and some of the beloved forms we now protect as heritage have been made illegal – many times over – with new restrictions on those codes. The fast-paced and concentrated development pressure spurred on by the streetcars was quickly released in the post-war era with broader car-oriented suburban development across the region. The most common zoning regulation on these lots was based on the singular faith that single-family zoning in lower densities was a deterrent against slums and the negative elements of the then-industrial city. For the last number of decades Vancouver has become a model of master-planned density set along a connective transit system. Redevelopment and reinvigoration of the urban core and the creation of new neighbourhood and town centres along transit corridors has branded Vancouver as a city of density. However, the power and persistence of the single-family zoning districts still has a vast impact to the shape of the City. Outside of specific core and study areas, Vancouver remains largely dominated by this typology. Vancouver is a transit-oriented city that has a near-complete grid of frequent transit corridors – most of which were set into place in the streetcar era. It is rare for properties to be more than 800m– about a ten minute walk – from one of these transit routes. Yet, it is easily observed that, beyond some directly-adjacent commercial districts and a few neighbourhood planning study areas, much of the land base crisscrossed by this transit is still dominated by single-family district regulations. Precincts around stations and transit are powerful places to increase densities and maximize transit use, but what about the rest of the City? Looking toward a more connected and complete city, it makes sense to begin by analyzing how this relationship between single-family housing and transit were interrelated. 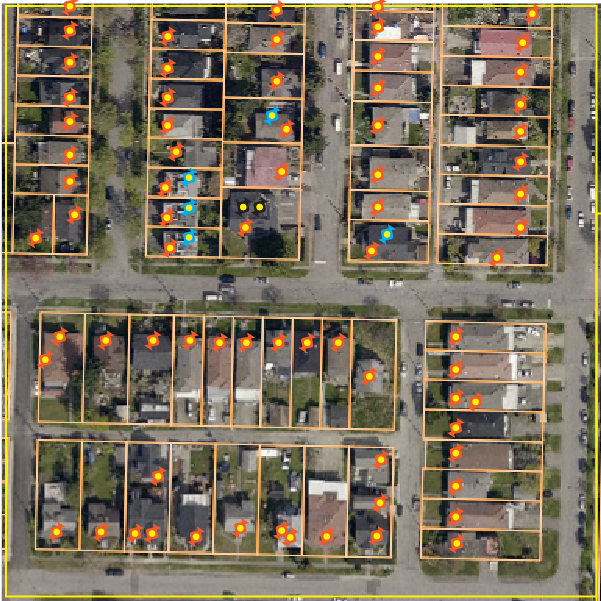 Rough analysis in GIS calculated about 67,700 single-family zoned dwelling parcels in the City. It will be noted that these numbers are rough but have been “corrected” to remove large parcels – often parks and schools remain RS1 even after their use change – and small parcels that could be vestigial segments of subdivided properties and streets. The RS1 One Family Zoning district presented in shades of orange represents approximately 51,900 parcels. While the remaining 15,800 parcels presented in varying greens represent the other RS2-RS7 Single-Family Districts’ properties. 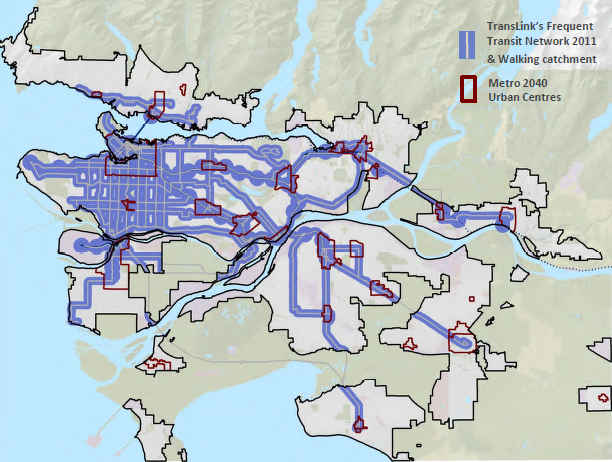 The map presents the network of frequent transit routes expected in the City over the next few years and highlights the routes presented in both TransLink and City of Vancouver transportation plans. Major rapid transit stations on the existing SkyTrain have been marked and five-minute and ten-minute walking circles have been overlaid onto the map. It is striking to see how many lots of single-family housing are present within these station areas. Areas outlined in blue are either frequent transit network development areas or planning work currently underway or completed by the City to create new transit-oriented multifamily zoned urban centres. This analysis looked at the amount of properties within certain walking distances to frequent transit to see how much of the “Single-Family City” is actually located within reach of transit-oriented corridors. At 800m or a ten-minute walk, we found that 67,600 or 99.8% of the single-family lots were represented. This number suggests that almost all of the single-family housing is within a reasonable distance from corridors to be considered transit-oriented. Often, this limiting distance is the outer edge of a transit area plan. Here, it is represented in the lightest shades of orange and green on the map. A five-minute walk is considered to be the distance from transit at which people are most likely to consider it a part of their daily routine. With 65,100 parcels within this 400m distance, we can consider 96.1% of the City to be within range to be considered oriented to a frequent transit route. In order to look at direct integration with transit, we added sites within 200m of a transit corridor. In essence, these are sites that are less than a block or two from a frequent transit corridor. They are presented in the darkest of our colour range and account for 44,800 parcels. We consider these single-family lots to be directly oriented to transit. They represent 66.1% of the total set of RS-zoned lots in the City. 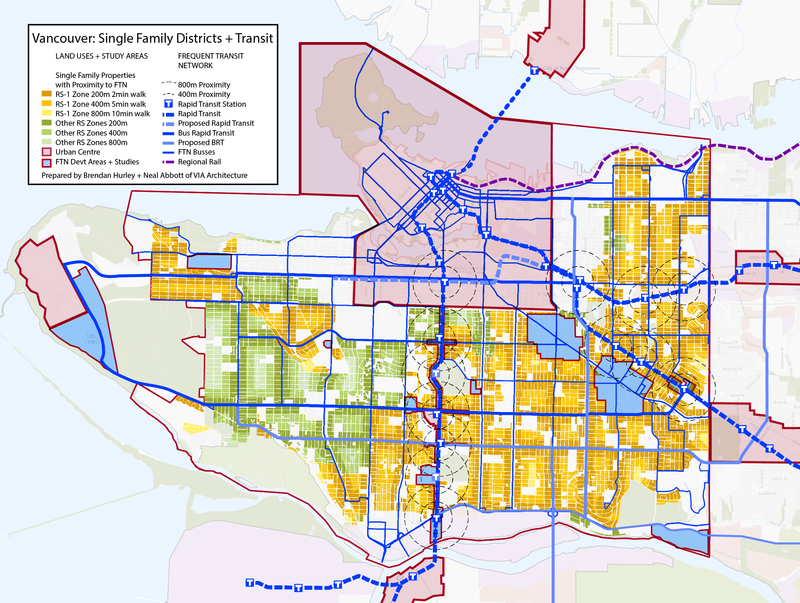 With the vast majority of lots within an attainable transit catchment, the City of Vancouver’s single-family zoned lands can be considered connected. The connective tissue is there to have our city look at a more urbane future. As the debaters on Wednesday presented, how this moves forward will require tact and a skillful balance. However, the debate of how to treat and what to do with these lands is now at a place of evidence to take place. From it the long overdue debate about what kind of city we want to live in can truly begin again. The Vancouver Cat Café opened up in International Village this last Monday. 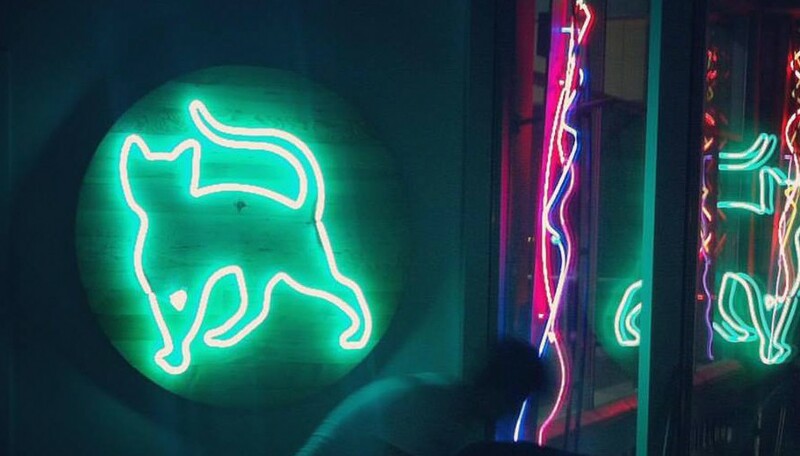 This curious little storefront is breaking some interesting ground in Vancouver. As part of our commitment to sustainable practices, VIA made sure that a high percentage of the built-in furniture from our former Homer Street offices in Vancouver were repurposed into new design and office projects. The Catfé was one of the beneficiaries of this program, and we have been excited to see how things have come along since their location in International Village was announced a few months back. The Catfé offers patrons the opportunity to purchase a coffee and then enter a separate lounge with a variety of potential feline friends. There is also a program wherein if one of these rescue cats and clients hit it off, there are BCSPCA adoption services available. It is an interesting prospect and has garnered a lot of buzz for the second floor of the shopping center at Stadium-Chinatown SkyTrain Station. International Village is one of VIA’s projects dating back to the early nineties. The Catfé retail space overlooks the entrance plaza that acts as the crossroads between Vancouver’s Chinatown and the sprouting Northeast False Creek neighbourhood that is growing around stadiums and SkyTrain station. This new activity may re-enliven this retail hub with new users and cat-crazy activity. Congrats cool cats. We can’t wait to see where it goes from here. Halloween is an urbanist holiday (shhh don’t tell anybody). Halloween as a Holiday – more than any other – is about neighbourhood. It is a holiday that teaches and surpasses what it means to be part of a community. I have a strong connection to this holiday, and as an adult still dress up in costume to both enjoy the night with my neighbours and to hand out candy to children and compliment their costumed efforts to keep that neighbourly tradition alive. However, as a planner and urban designer, this holiday taught me a great deal. As a child dragging a pillowcase full of sugar treats through the night, I learned a lot about city-building, even if I wasn’t aware at the time. This is a holiday that survives on social capital, but is also innately reliant on the built environment. The basic premise is right in the phrase joyfully screamed at each doorway: “Trick-or-Treat!” It is a social contract that demands participation from both sides (I give more candy to those with more effort and heart in their costumes), but is also inherently connects that participation to the larger community. The act of decorating yards with jack-o-lanterns is to be explicit about participation as a “neighbour”. The young, going from door to door, are shown their connection to their community and their place with each glowing pumpkin or “scary” display, expressing connection and distinctiveness of each “home”. The tradition of Trick or Treating, as it still exists, by its nature of going from door to door is a very urban act. One thing it teaches a child (or at least this planner-to-be) is about livable density. Because my family had moved through a number of neighbourhoods when I was young, I started realizing that not all were built equally for the door-to-door quest. The desire for MORE CANDY forced into me a realization that some neighbourhoods were hard to walk through and garnered little loot, while others left me with more candy than my small arms could carry. The main metric for success of a trick or treater, at least as Seinfeld reminisces, is to “GET CANDY”. What made these neighbourhoods different was their form. Legends of wealthy suburban houses giving out full size candy bars, didn’t chalk up to the knowledge that I could fill a pillow case to capacity if I went through the socialized row houses and tight packed smaller houses of inner-city working class family neighbourhoods. At a young age I worked out a simple equation: More doors to the street per block = MORE CANDY= better. At VIA, we like to back-up our poetic declarations with mathematics, so I have decided to ruin my inner child’s favorite holiday with math homework. 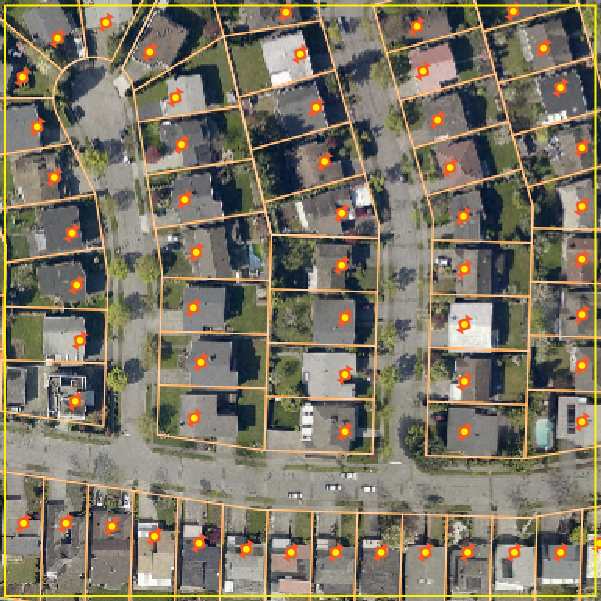 I looked at three representative neighbourhoods in Vancouver, BC (where I grew up) to calculate where a child could get the best candy haul. The Inner-City Street Car Grid neighbourhood presents a tight grid of streets, alleys with a mix of older and Vancouver special houses. The Suburban Neighbourhood has large houses on loop and disconnected cul-de-sac streets. 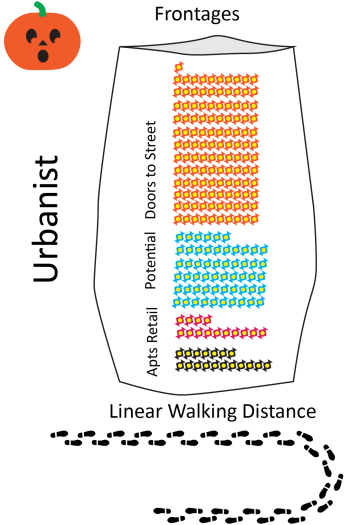 The Urbanist neighbourhood shares the tight street grid with the inner-city neighbourhood, but includes a layer of pedestrian access and dense rowhouse forms that tightly pack those streets with units. I have bounded those areas into a 200m (700ft) square. This 4 hectare (10 acre) box gives us at least a couple of blocks to examine and explore as a hypothetical trick-or-treater. As a planner it also gives us some consistency of built form. 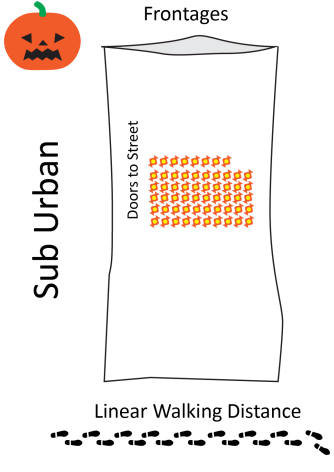 Doors to the Street [represented below with an Orange candy]: These units have a stoop or door facing public space. Potential Doors to The Street [represented below with a Blue Candy]: These units have access that could potentially be opened to the public, but face what is often shared or private open spaces. In the case of houses, these could also be counted for secondary dwelling units. Retail Frontages [represented below with a Red Candy]: These sometimes participants should not be excluded from the festivities especially in mixed use neigbourhoods. Above Grade Apartment Units [represented below with a Black Candy]: These units are often not directly accessible to the street and were not counted. These inaccessible apartments show why a direct unit-count might not be as useful of a metric, especially in terms of filling a pillow case. I have not included these in the count. In order for an accurate experience of trick-or-treating to be presented I felt it was worth showing the amount of approximate linear distance a child would have to walk to complete their bon-bon run. I should note that I calculated this as a general distance and did not include the small movement into and out of yards for individual houses. 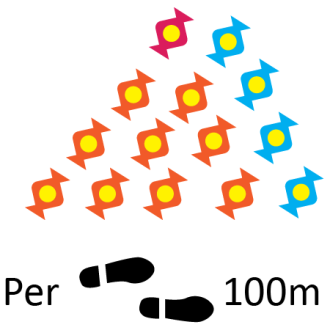 To show this movement, sets of footprints on the diagram represents about 100m (300ft) of walking and generally how far someone would have to walk in order to knock on all the doors of the neighbourhood. By The Numbers, What Are the Best Neighbourhoods for Trick or Treating? 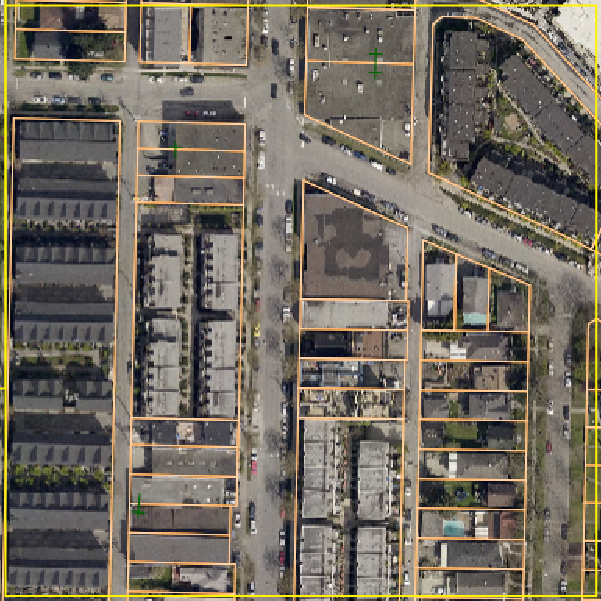 The old streetcar neighbourhood that I examined is pretty typical of Vancouver or many inner-city streetcar era neighbourhoods across North America. 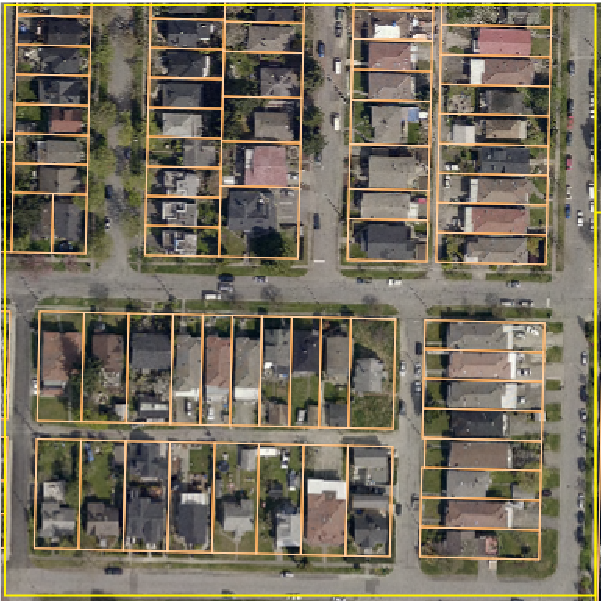 It has lanes, ~10 m (33 ft) wide lots, regularized streets, and many single family homes. 4 hectare (10 acres) of this older urbanism has the ability to present 73 doors to knock on. 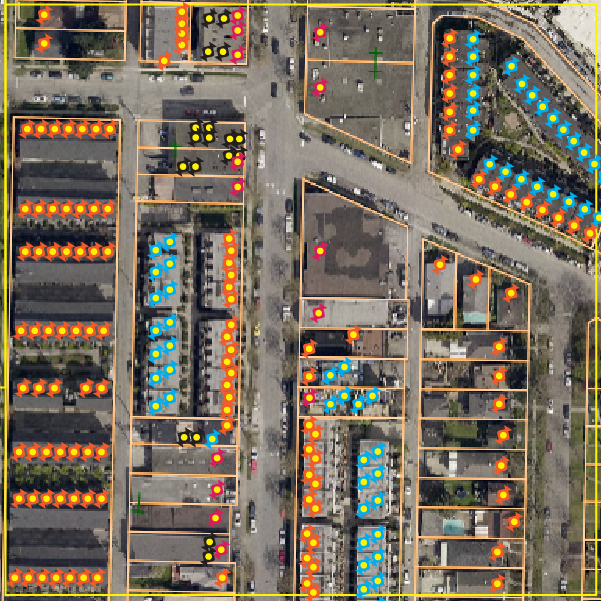 With the inclusion of secondary suites (I only counted five explicit side doors, but there are likely more) and laneway suites that count could increase substantially. I easily see it filling to 30 more and filling the pillow case up beyond 100 candies and ten pieces per 100m. But that would come with official addressing and legalization of those suites. The loop and lollipop suburban neighbourhood that I looked at was in the far south-east of the City. 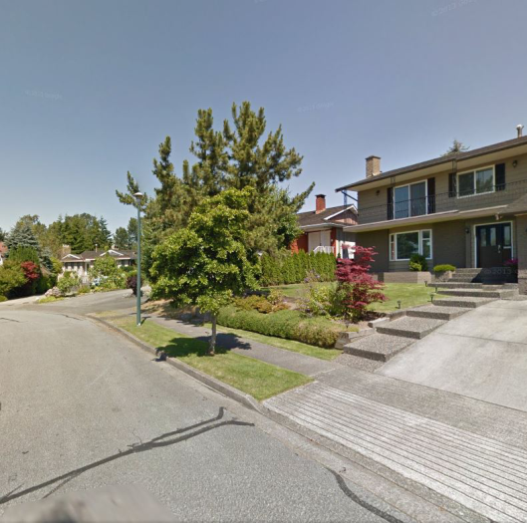 This is not a common layout in Vancouver proper, but is very typical of most of the City’s post-war auto-oriented suburbs. It has no lanes, 15m+ (50ft+) wide lots, curvilinear and disconnected streets, and only single family homes. 4 hectare (10 acres) of this auto-oriented form has the ability to present 58 doors on which to knock. This is a thinner pillowcase of candy. 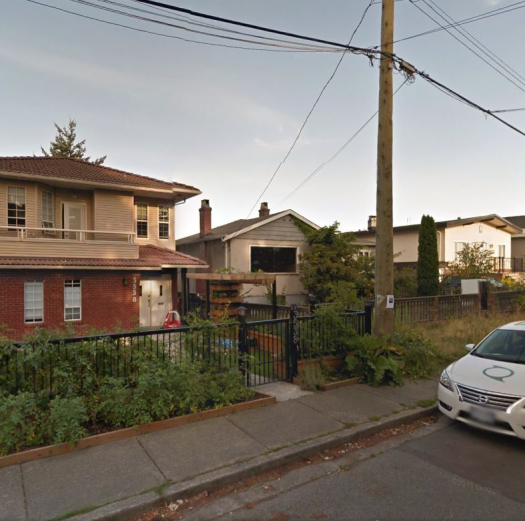 It is difficult for neighbourhoods like this to grow without changing how they are laid out, but there is potential for infill and secondary suites here. I will however note that this area in Champlain Heights is adjacent a number of housing complexes that are much denser and connected than these houses. In fact they are an older analogue to our last examined neighbourhood type. This mixed-use redevelopment in the Cedar Cottage neighbourhood infills the typical urban grid of Vancouver, but adds a layer of new development and new connections. It activates all of its edges with doors directly facing the street and lanes. This is not as typical in Vancouver, but is a development type that is gaining traction in many recently re-planned areas. 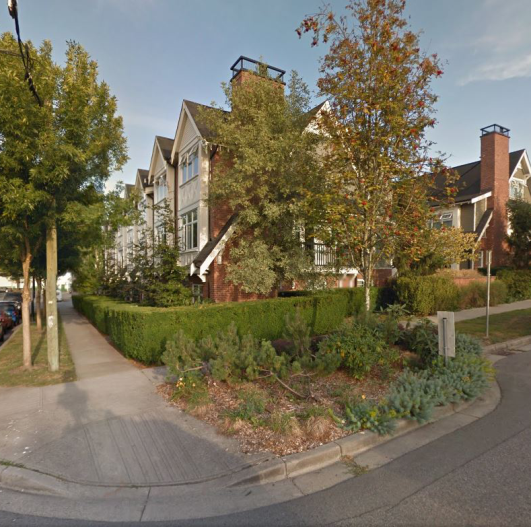 Many of the design lessons here are connected to the older housing complexes in False Creek South and Champlain Heights (great trick-or-treating neighbourhoods in their own right). It has lanes and a mix of lot sizes, but tight frontages and minor, to even non-existent, setbacks. 4 hectare (10 acres) of this pedestrian- and transit-oriented form has the ability to present 121 doors facing the street on which to knock. With the inclusion of the second layer of rowhouses and retail frontages the number of potential candy doors increases to 195. 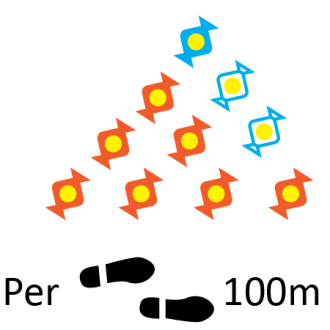 That is 14 pieces of candy per 100m (300ft). I will also note that this neighbourhood is only a little more than halfway through its redevelopment and that future potential is not counted in this analysis. Anecdotally, I have found that the densities of frontages also mean that more people participate in making front door displays and giving out candy. It becomes part of a localized culture. Intrinsically, I knew other things about these neighbourhoods as well: they are more likely to have more movement choices and access to transit and they were more likely to have a mix of uses, including some retailers that would give out treats (unfortunately less likely to be coveted chocolate). I am observing that retailers have an increasing role in this holiday, and now indoor malls often have day-time trick-or-treating events as well. In many suburban areas these malls may be the strongest concentration of doors that children will know… but I still feel it pales to true night time trick-or-treating. I also want to note that I am not including the apartments in these calculations as they are inaccessible to the candy searchers on the street. If these neighbourhoods were made of apartments with lobbies, such as those commonly built in many core neighbourhoods in the 1930s through 1970s, the number here could drop to as low as 25 doors accessible to the street. In this way, the densest neighbourhoods could by far provide the lowest number of treats (one to two candies per 100m of effort) for local children. 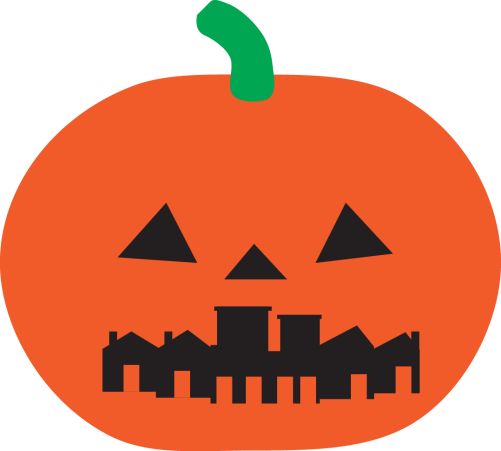 I have found, as a planner, that this jack-o-lantern metric holds up as a definer of urban livability. It is a function of density, but it is also about neighbourhood connection and activation. 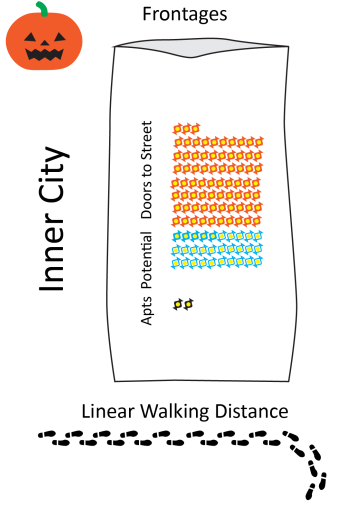 If a neighbourhood has more units with more connection to its streets, the likelihood of those streets being part of a child’s territory is also increased. These are generally healthier neighbourhoods with active opportunities for interaction and social capital-building. They are healthier, save for the increased risk of cavities carried in their heavier pillowcases and treat buckets every October 31st. Nearly two years after state officials unveiled a preliminary design for Tacoma’s new Amtrak station to critical comments from Tacoma citizens and the architectural community, a final rendering is being rolled out this week by the Washington Department of Transportation. The final image bears little resemblance to the warehouse-like initial concept. The planned station has been relocated from the west end of historic Freighthouse Square to the 100-year-old former Milwaukee Road freighthouse’s middle section. The corrugated metal walls envisioned in the original plan have been replaced with extensive glass walls, some of which will move upward in pleasant weather to make the station area open-air. A second track and an additional loading platform have been added to the station’s south side to allow for two trains to be handled simultaneously. A public corridor also has been added on the station’s street side to connect the two sections of Freighthouse Square separated by the station. Last weekend, VIA hosted an interactive table at Design in Public’s Seattle Design Festival Block Party we called Share the City. 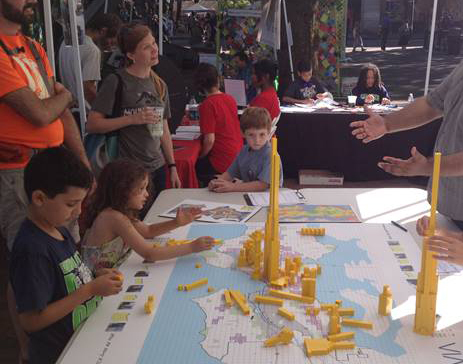 Block Party attendees were invited to try their hand at city planning by placing yellow LEGO® bricks onto a large map of Seattle. The goal of the activity was to educate the participants on how and where Seattle is planning to grow, and what tradeoffs the City must consider when planning for that growth. 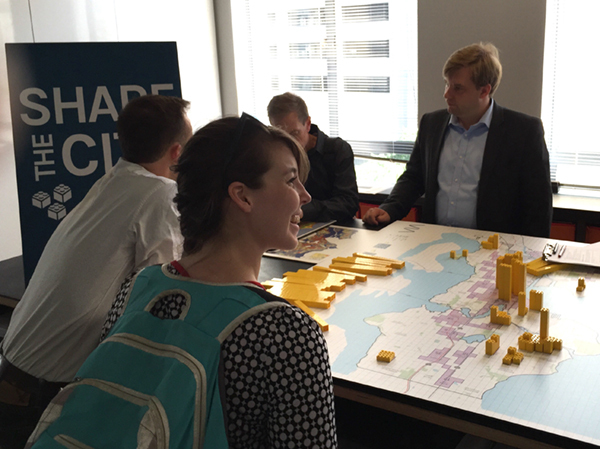 Participants had the opportunity to shape their own solutions for how to accommodate the 120,000 new neighbors projected to arrive in Seattle between now and 2035. The VIA team started with a map of the Seattle’s urban villages—areas the City designates in its comprehensive plan as centers for growth. In each urban village, we calculated the approximate number of people that center was expected to add and decided to represent those people with yellow LEGO® bricks, with each brick representing roughly 100 people. The task was to distribute the bricks across the urban villages according to City plans, or to propose one’s own strategy for providing homes for Seattle’s growing population. What we found was no surprise—while people were interested in learning about the City’s plans, they were much more interested in creating their own rules. Creative new ideas about housing, many from the City’s next generation, included a wide range of approaches—from a new multifamily Space Needle to a neighborhood-sized treehouse to a residential megastructure bridging Elliott Bay. Many cited proximity to parks and transit when placing their bricks, and others questioned convention by placing theirs over water as well as within industrial districts. Over the course of the event one thing became clear: when invited to collaborate and engage in creative activity, people approach a complex problem in a playful way, crossing demographic barriers and giving rise to a rich diversity of outcomes. Given all the challenges we face as a growing city, VIA will continue to look for creative ways to engage our clients and the public in a creative dialogue about our common future. In collaboration with the Pomegranate Center, VIA’s Community Design Studio is providing design services for a free-standing beach house pavilion in Neah Bay, WA. Situated on the dramatic Pacific Ocean-facing shore known as Hobuck Beach, the pavilion is located near the northwest tip of the contiguous United States. 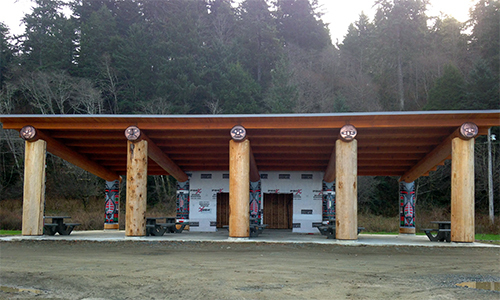 Its covered space will provide the Makah Tribe with gathering space for community events and dance rehearsals, as well as a separate artist studio designed to accommodate carving and weaving activities. 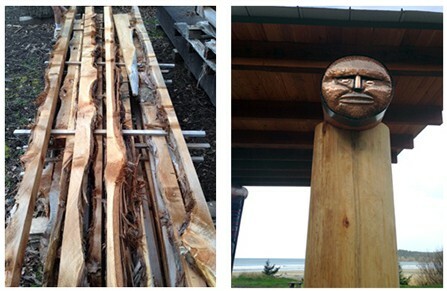 The heavy timber columns showcase carved designs by the local artists. The majority of the structure was completed in the winter of 2014/2015, and it has been named Be?is, which means “Beach House” in the traditional Makah language. 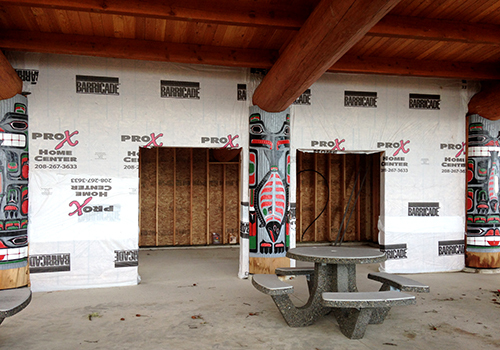 From today (Friday, April 10) through Thursday, April 15 the Makah community, the Pomegranate Center, Forterra, and a few representatives from VIA will be participating in a build event to complete the remaining artistic elements of the project. 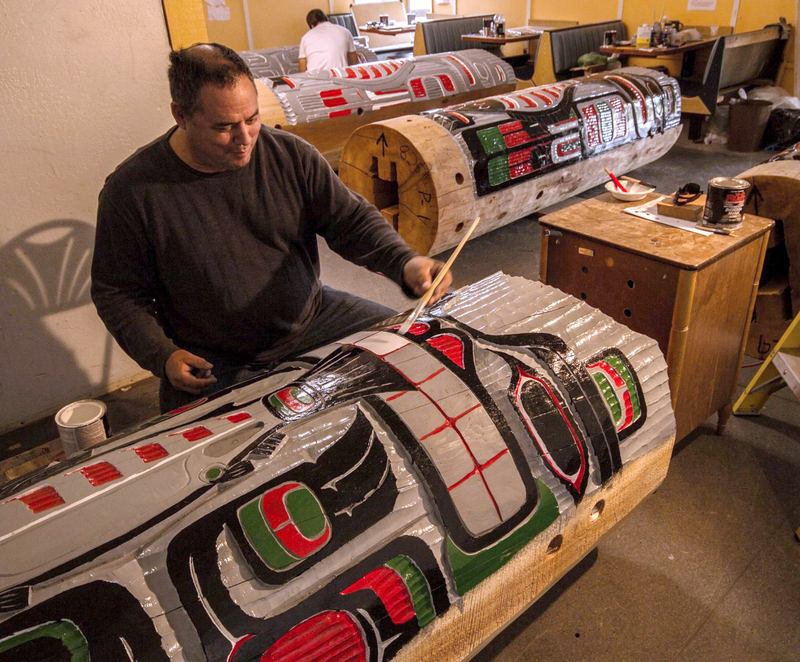 A total of 40 cedar benches will be constructed and carved. The carved elements are designed such that, when not in use, the benches can be stacked in groups of five to reveal a complete image. During inclement weather, the bench stacks can be placed between the carved columns to block wind-driven rain and allow the events to continue. 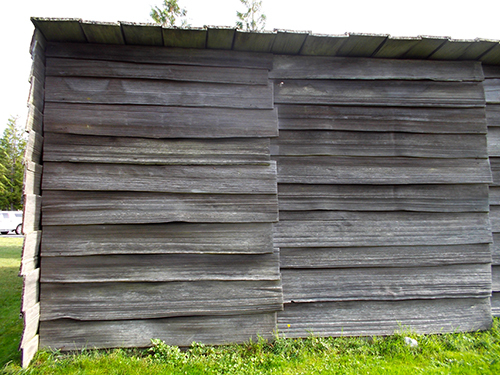 Large profile cedar channel siding will be installed on the artist studio, referencing the traditional Makah longhouse construction in a modern way. The leftover live edge cuts from the benches will be used as creative treatment around the doors and edges of the artist studio to make it unique and eliminate material waste. Artists will be creating woven cedar elements which will be cast in resin panels and installed in lieu of glass into the doors to the studio. An outdoor fire circle will be constructed of stones from the site, along with stepped access down to the beach. This is going to be a very exciting event, bringing together folks from all walks of life and various communities to create art and realize a vision. Stay tuned for final project images!